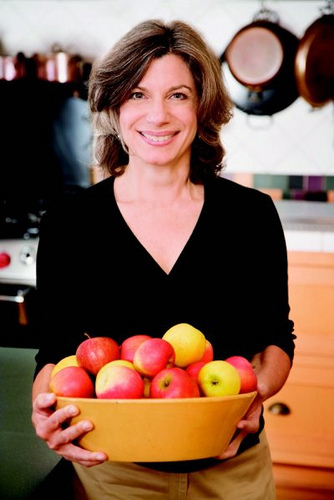 Foodista | IFBC SaMo Speaker Announced: Amelia Saltsman! Amelia Saltsman is the author and publisher of the award-winning The Santa Monica Farmers’ Market Cookbook: Seasonal Foods, Simple Recipes, and Stories from the Market and Farm. A long-time champion of small family farms, farmers’ markets, and home cooking, Amelia brings her passion to print, web, radio, and public appearances. Her work has appeared in numerous publications, including Bon Appétit, Cooking Light, National Geographic Traveler, and the Los Angeles Times. She is a frequent guest on KCRW’s “Good Food with Evan Kleiman” and is a contributing editor to the annual food lover’s guide, Eat: Los Angeles. Amelia serves on the California Certified Farmers’ Markets Advisory Committee. Described by Alice Waters as “an amazing resource,” The Santa Monica Farmers’ Market Cookbook is a self-published regional book that has gained national recognition. It was carried by Anthropologie stores across the country and is a perennial bestseller at such venues as the LA County Museum of Art, as well as local Barnes & Noble, Costco, and LAX stores. Now in its fourth printing, her book has become a beloved bible for market shoppers everywhere and has won several awards, including the Writers’ Digest Grand Prize for Self-Published books and a PubWest design award. Amelia is currently working on a series of seasonal E-Cookbooks. Amelia is committed to raising the food literacy rate: knowing how, when, and where our food is grown and by whom; knowing how to cook a simple, healthy, and inexpensive meal; understanding the local and global impact our food choices have on our families and communities; and understanding our place in the cultural and historical food chain. All while having a good time.